This was the title of an article on Dot Earth, as I read the associated New York Times article in Le Figaro as this newspaper now proposes a selection of the best articles from the NYT. The article is about how natural gas – and methane – is leaking through the miles and miles of pipelines and installations all over the world, thus adding even more greenhouse gases emissions. As Mister Revkin notes this could be fixed quite fast and save money, energy and greenhouse gases emissions. This sounds like another win-win-win situation. 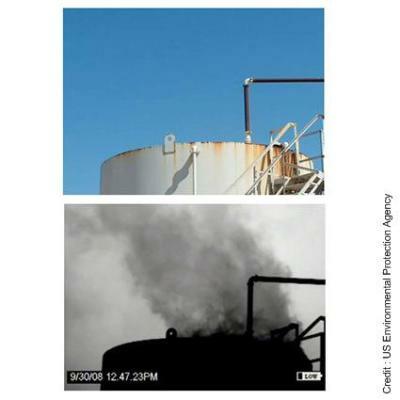 To the naked eye, there was nothing to be seen at a natural gas well in eastern Texas but beige pipes and tanks baking in the sun.But in the viewfinder of Terry Gosney’s infrared camera, three black plumes of gas gushed through leaks that were otherwise invisible. As a result, some three trillion cubic (1) feet of methane leak into the air every year, with Russia and the United States the leading sources, according to the Environmental Protection Agency’s official estimate. (This amount has the warming power of emissions from over half the coal plants in the United States.) And government scientists and industry officials caution that the real figure is almost certainly higher.